On one of those days where the kids are bored and you need something inexpensive to do, take a Potato Head adventure; the only cost is the price of gas. There is a total of 8 left in RI. A friend and I searched them out over the course of several trips and much research. I have taken all of that away for you. We truly made it an adventure, finding them and taking selfies with each. I have them listed in no particular order. The Original Mr. Potato Head – located in Pawtucket at 1027 Newport Avenue. 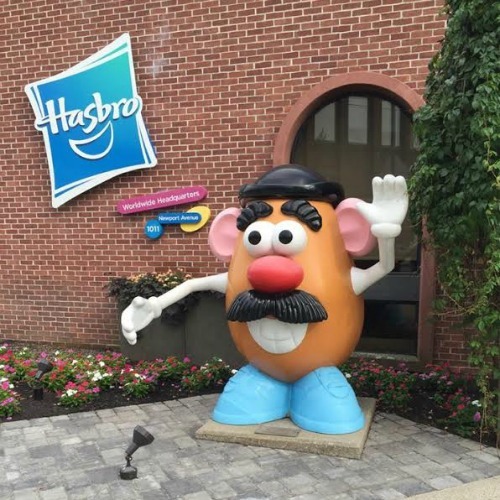 He is right outside the Hasbro headquarters building. Rumor has it that as of October 2016, this potato is missing. I’m not quite sure if he was removed for repairs or kidnapped, but hopefully he has returned. If you want to verify if he is there before you go, call ahead at 401-431-8697. Firefighter Mr. 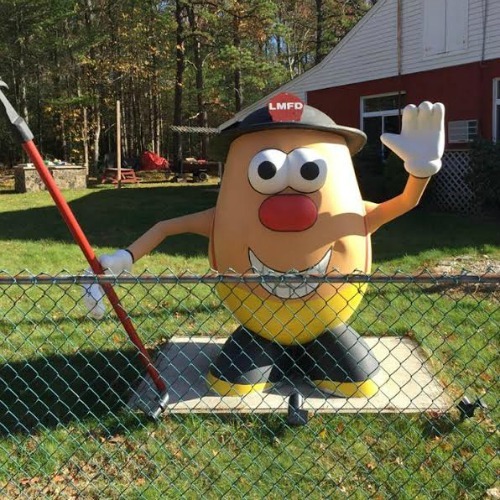 Potato Head – Located at 166 Mishnock Rd, West Greenwich, RI at the Mishnock Fire Department. You can’t miss him. 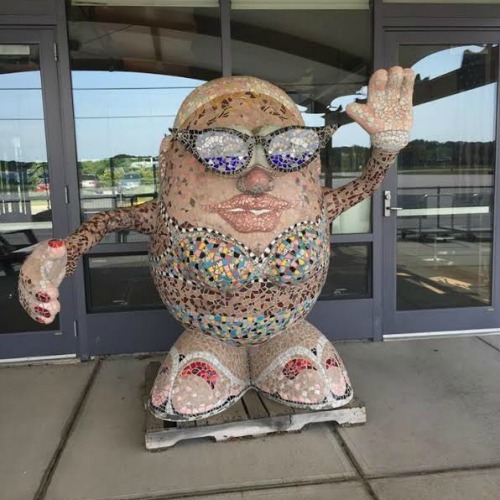 Sun Baked Potato – Located in Westerly, RI at the airport. You must go through the lobby and out the door in the back. Staff was very nice and had no issue with us doing this. She is on a pallet and apparently is moved around, so you may have to ask where she is. Meet the Potato and Vino D-Vine – This is a two-for-one deal. 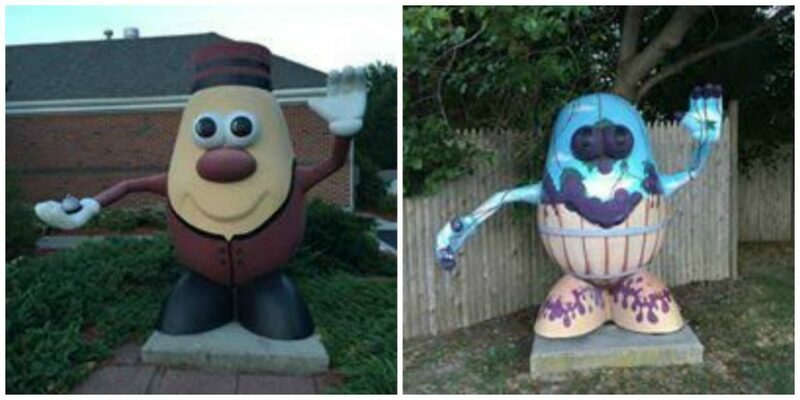 The 2 Potato heads are located at Clements Market in Portsmouth, RI. 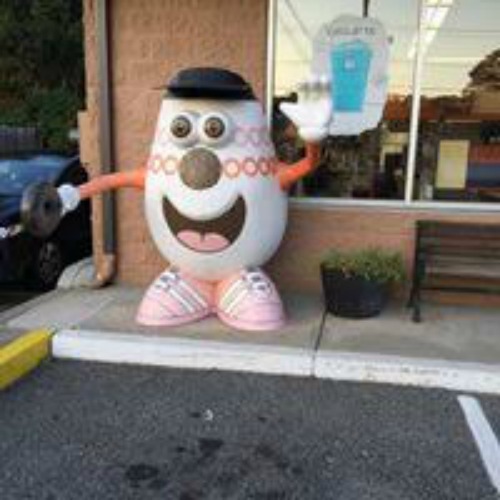 Regular Joe Potato – This potato is located at the Dunkin Donuts on Metaco Road in Warren RI. 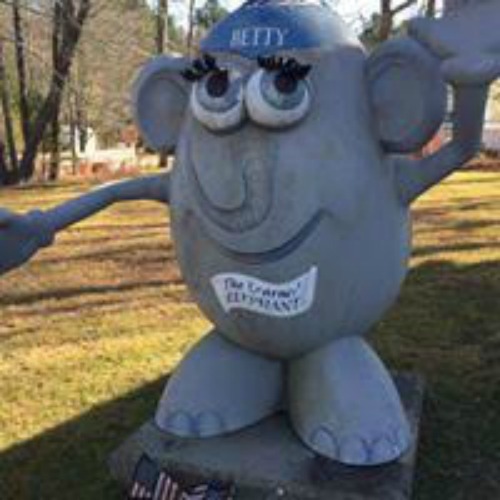 Elephant Potato Head – This one is in Chepachet, RI behind the town hall and next to the small white one room schoolhouse. Red Hot Mr. Potato Head – This potato is located outside the Day-O-Lite building on Chestnut Street in Warwick, RI. There is also a Patriotic Potato Head in Bristol, RI that is only brought out for the 4th of July parade. We missed him, but hope to see him this summer. 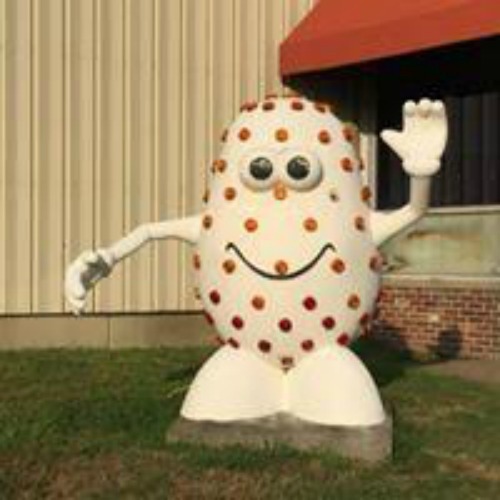 My friend and I loved hunting down these Potato Heads (of course, we love roadside attractions and oddities) and hopefully you and your family will too. Be sure to stop by my Instagram ( https://www.instagram.com/adventuregirls0608/) and Facebook page (https://www.facebook.com/Adventuregirls0608/) that chronicle our many adventures and maybe you’ll find a few ideas! My name is Rachel and I'm the single mom of a 14 year old boy. I am a Registered Nurse nurse caring for our nation's veterans. I'm a amateur photographer and a self-proclaimed "adventurer"; I am always looking for for free and inexpensive ways to enjoy life. This sounds like a great treasure hunt to take my boys on. I remember when my kids are into this potato thingy. We have diffferent kinds before but I donated them already. Those are cool. I can remember growing up with Mr. Potato Head. He was one of my favorite toys and my boys enjoyed him when they were little too. This would really be a fun and inexpensive adventure! I will try to look around our area and see what kind of scavenger hunt I can come up with that me and my grandchildren would enjoy. Thanks for the idea! How interesting! Would be fun to do this with the kids just because it’s fun to find stuff like this. I love doing stuff for the family and this would be a great way to do that. If I ever get out to Rhode Island I would definitely check is out. I have always loved Mr PotatoHead! This would be so fun to see. These are awesome statues! These are just so darn adorable. I played with Mr. Potato head as a kid. Rhode Island has it going on the the potato head. I never knew there so many Mr. Potato Heads in RI! How fun! It would be great to draw a map and go to each one of them like a game. That is exactly what we did. We actually found out that there may be a few more, so look for possible follow up to this! I had no idea! I’ve never been to RI, but will have to make a stop when I do my East Coast road trip – my son would enjoy seeing all the statues. I never knew they had these in Rhode Island! We have never been there, but hope to do some traveling on the East Coast this summer. It has so many great locations to visit. I’ve actually never been to Rhode Island before. Now that we live on the east coast, I’d love to visit for a long weekend! I have never been to RI but I have always wanted to visit. Looks like a fun time for sure! This would be a fun thing to do with the kids. We have never been up to Rhode Island, but I think if we ever get the chance we would go Potato head hunting. How cool! I love finding unique sites like this when we travel. My husband is always on the lookout for cool things like these Mr. Potato Head statues in any area we’re traveling to. Agreed, Pam. And it won’t cost you extra to go on an adventure like this. I remember when we were kids, every time we went on a road trip with our parents, we had a game like, “who could spot the most number of white Volkswagen beetles.” That was actually a fun time! I had no idea that they had these in rhode island! I’ve never been – but now I want to check these out. Silly right? But like you – I love roadside attractions and oddities too! I am obsessed! So clever! I love the idea of using Mr. Potato head as a travel ambassador. So many cute outfits too. I used to love Mr. Potato as a kid, that sounds so amazing! I bet the kids had tons of fun! I would love to go there one day! Okay, I just LOVE these! My son used to love Mr. Potato Head and I think even now he’d enjoy seeing all the statues. It reminds me of Toy Story! That’s what I always think of when I see a Mr. Potato Head. I had no idea there were any Mr. Potato Head statues. I would love to take my kids to see them. Mr Potato Head is one of their favorite toys. What a fun and cute idea! Chicago tends to have things like cows and other pieces of art all over the city during the summer. My kids get such a kick out of it. This is literally the cutest things I’ve ever seen! I had no idea this existed, and the next time we visit Rhode Island, my kids would die to see this! We love Mr. Potato Head! I love all of those Mr Potato Head statues!! How fun!! This is such a great idea and I think it’s work for adults as well. I remember that I went in a bit of adventure went I was on Liege. You can take a story to follow and walk through the city to find every clue. It was so fun. This sounds like a perfect adventure for kids! I have never been to Rhode Island before! I would love to do this one day! Try companies are so smart. Creating statues to promote their toys. These are all so cool. What a fun idea for a treasure hunt with the kids. These are so neat! I really liked Mr. Potato Head when I was a kid. I think it was an awesome idea for Rhode Island to use the Mr. Potato Head as an ambassador. This would make a great inexpensive idea indeed to hunt down the Potato Heads. Thanks for sharing the information. That’s so cute! A Mr. Potato art scavenger hunt sounds like a lot of fun for anyone in the area. That sounds like a fun adventure to take with the kids if you’re in the area. I think my kiddos would love it. I didn’t know there were so many of them there. The scavenger hunt idea is something that even adults will enjoy. I’d love to have my pics taken with all of ’em. Lol. What a fun scavenger hunt for you and the kids! I can’t wait to do stuff like this with my kids when they get a little older! This looks like so much fun. It’s a selfie addicts dream. So many cute potato heads to take photos with. that is too cute! It reminds me of the painted horses we have here in Ocala. One year local artists were commissioned to paint these horses and now they are all over our town. It;’s always fun to try to find them all. These are so cool. We have something similar by us along the beach. They have a bunch of sea turtles painted by different people. These look so cute. I want to go hunt some of these down now. omg i havent seen a mr potato head in years. brings back so many memories. I’m sure you had a great time! Haha so cute! They have been an icon since Toy Story. Would love to go in person! Cute post. Mr. Potato Head is currently very big in my household. Both my 3 and 6 year absolutely love them. Sadly, I’m on the west coast and no where near these guys. These are all so fantastic! I love them! How cool is this!? I would love to see Mr. Potato head! I haven’t gotten my boys this toy yet but I’m sure they will love it! So old school but it’s an awesome toy! Okay, those are WAY cool! If I ever make it up the coast that way I will definitely have that on my list to check out! What a fun adventure. We love to find off the beaten path stuff like that when we travel. Statues and factory tours are always the top on our list. OMG, how funny is this. Mr. 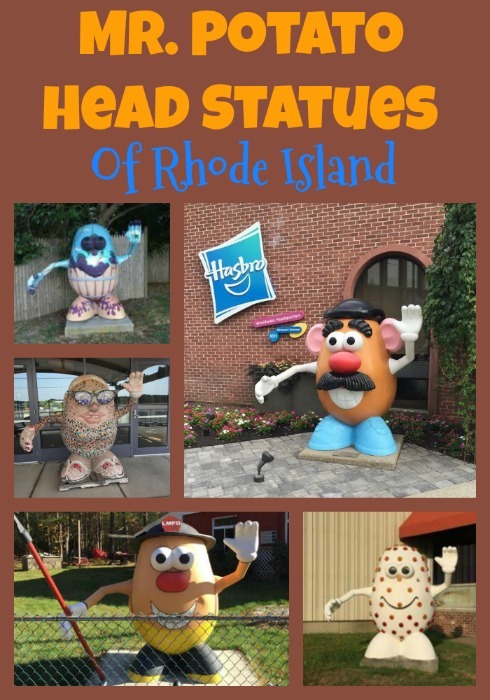 Potato Head is a classic and what a fun way to celebrate Rhode Island. Got this bookmarked if I make it out that way. This is terrific. My son goes to sleep away camp in RI and this would be a ton of fun to do when we go up for visiting day, we have to take him off campus for the whole time. Which of these is near Wakefield? I think we cold get to the airport one! What a fun and creative idea to do with the kids. I am saving this so if we ever go to Rhode Island, we are so doing this! I have never been to Rhode Island but now that I know about these Mr. Potato Head statues, I really want to go. I love how realistic they look and they bring me back to my childhood. These are hilarious! My kids used to love their Mr. Potato head, they would really enjoy this. Omg how cool!!! My daughter would think seeing these potato heads in person would be the coolest thing ever!!! My kids have been playing with Mr Potato Heads for years. They always have fun with them. I would love to take them to see these statues. haha Look at the potato head! I’d have a ball there! Love all the stuff to do there, never knew about some of them either! Those are too cute! We have something similar here except they are swans. It sounds like a fun idea to hunt all of these Mr. Potato Heads down when you’re in Rhode Island. I love learning about inexpensive ways to entertain the kids. You don’t have to be a millionaire, you just have to be creative! Ooh, this is the kind of tourist trap that I love! I was excited to get my photo at the Disney resort that had Mr. and Mrs. Potato Head. This would be a fun way to add to my photo collection! We are long overdue for a visit to Rhode Island. I know a few of my boys would LOVE seeing all the Mr. Potato Heads. This reminds me of the time my son played with Mr Potato head when he was a toddler. This looks like a fun and adventurous play to visit. I know my son would like going. This looks like such a fun experience for kids and grownups alike! This might be the reason we visit Rhode island! How fun and all of the Mr Potato Head statues are really neat. 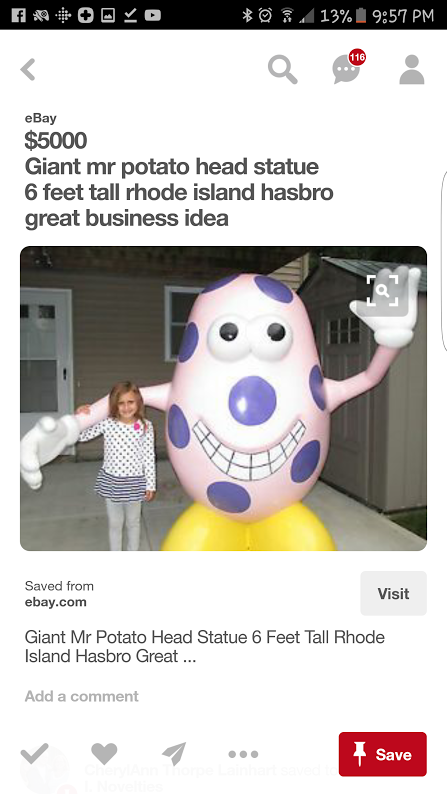 I had no idea Hasbro was based in Rhode Island. This is awesome! We’ve been watching Toy Story a lot in my house and seeing Mr. Potato Head would be a big hit! This is awesome! We’ve been watching Toy Story a lot in my house and seeing Mr. Potato Head would be a big hit with my daughter. Those may possibly be the coolest thing I have seen all day, I love mr. potato head kinda really wanna go there right now. This is way to funny and absolutely adorable! I would definitely take kids to see all of these Mr. Potato Heads! I am honestly not aware of this! It’s so nice to be able to show these potato heads to the kids or even hunt them down! I would love to see these in person. I’m pretty sure that my kids will love to see mr potato. Im gonna bring my kids there. This looks really neat and a fun place to be. How fun to have a road trip/Mr Potato Head search! I didn’t realize that Hasbro was in RI. It’s one of our favorite brands for games! Wow how fun is this! I had never heard of this before, but I think its pretty cool! Would be something really great to do with the kids! Omg this is hilarious! I want to go! I don’t know why Mr. Potato is so awesome, but i have always loved him and his wife! Such a fun post! What a great way to spend a day with the kids- I know my kids would love it! Oh wow, that’s cool! We have dolphins around our town. I never thought about doing a scavenger hunt. Great idea! How fun are these?! My girls love Mr. Potato head. What a fun thing for your kids to see. I’ve never heard of this before! That is so cool! I think my kids would be over the moon to do a scavenger hunt like this. That is so neat! I had no idea. My kids would love to see these! Definitely something to bring my son to this Summer. He loves Toy Story so he would remember Mr. Potato Head lol. I love the Mr. Potato Head statues so much! We used to have Cows in our town in CT. Such a fun thing to do! I had no idea Mr. Potato Head was still so popular! I remeber playing with one all the time when I was younger. Now these are awesome!! I’ve known of the cow statues in chicago and the cakes in st. louis, but these are totally fun and different! Hope I get to see them before they go off display! These are super cute! My kids would love them. We actually got them Mr and Mrs Potato Heads for Christmas the year that Toy Story 2 came out. Those are so cool! We have things around our neighborhood similiar to those. They auction them off every year and then change them for the next spring. I love Mr Potato Head… This place looks amazing, I would love to take my kids there! This would have been super cool to see. I love Mr. Potato Head! What a fun idea for a family day out! Who does not love Mr. Potato Head? Thank you for sharing. What a fun and unique place to visit! Any kid (or adult with young kids) would love it! Such a fun time! Wow! Who would have known! This is a really cool idea and one of a kind statues. I loved Mr. Potatoes head! How fun! I love Mr. and Mrs. Potato Head. You know I love art too! OMG SO COOL!!! I loved Mr. Potatoe Head as a kid!